The American elm is a handsome tree that can grow to heights of 100 feet when left unscathed by a fungal malady known as Dutch elm disease. The disease, carried by a specific type of beetle, infects the elm and can cause its premature death. Luckily, the disease does not strike until the tree reaches a reproductive age, allowing the elm to continue propagating. The American elm has foliage that you can identify if you know the shape, color and other features of the leaves. Measure American elm leaves, looking for a leaf that averages between 4 inches and 6 inches long. The leaves will be approximately 1 to 3 inches wide, states the “National Audubon Society Field Guide to Trees,” giving the American elm leaf an oval to elliptical shape. However, American elm leaves can and often will differ in size among the individual trees. An elm standing right next to another elm may have leaves that are 2 or 3 inches shorter than its neighbor possesses. Inspect the base of an American elm leaf, focusing on the area where the stem and leaf join. In many instances, the base will be asymmetrical, says the Ohio Department of Natural Resources. This is a trait of many types of elm trees within this family of plants. The base will not join uniformly, with the edge of the elm leaf being obviously uneven. Observe the edges of the American elm leaf, looking for double-sawtoothed margins. These serrations, like the teeth on a saw, are all along the borders of the elm leaf. Study the many smaller veins that fan out from a longer middle vein on an elm leaf. The veins are quite noticeable and run straight from the midrib of the leaf all the way to the sides of the leaf. Look at the colors of American elm leaves in the summer and then again come the fall months. The upper leaf in summer is a dark green shade, but the underneath surface is a bit duller and lighter. The fall colors, while not usually vivid, in some years can be golden-yellow. Many times, though, the leaves turn a different shade of green, with some yellow leaves mixed in, before falling. Feel the surfaces of an American elm leaf. The upper leaf, although it may be somewhat rough to the touch, is typically without any pubescence (hair). The lower surface of the leaf may feel fuzzy, as soft and tiny hairs grow on that side. 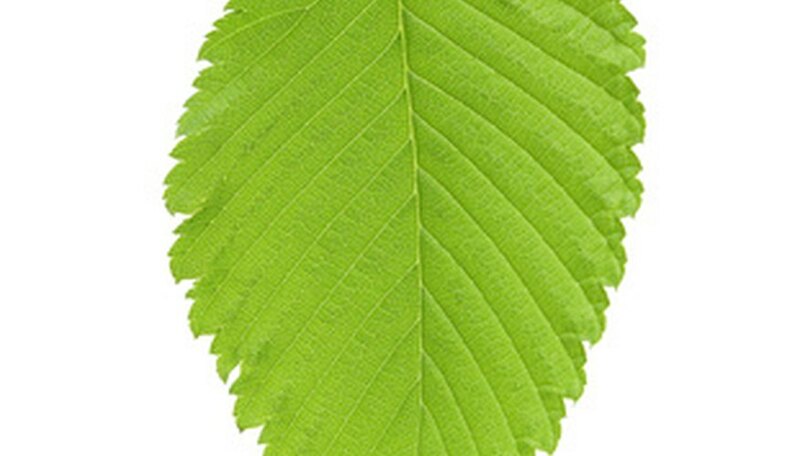 The main difference between American elm leaves and those of the very similar slippery elm that also grows in the eastern part of the United States is that slippery elm leaves have a much rougher texture, in addition to being slightly larger.